Two communications arrived in my in-boxes a day apart … and I couldn’t help but see them as similar. Property spruikers Sean Wood and Steve Goodey are soooo keen to get you along to their hyperbolic sales pitch that if you buy a ticket to attend (instead of getting one free from an affiliate, or the buy-one-get-one-free deal they’ll probably trot out any minute?) … and stay the entire day (groan) … they’ll put you ‘in the draw for a chance to win a $400,000 house!’ (Terms and Conditions apply) — well, naturally. Promotion for the Sean Wood Steve Goodey roadshow. Sit through it and you might win extra cheese. Terrific! I don’t even remember entering — and no (Terms and Conditions apply) …. yowser! I remember about five minutes ago when Steve Goodey was hooked up with a different spruiker Dean Letfus and self-proclaimed internet wunderkind Shaun Stenning in the (now defunct?) NZ Property Guru’s [sic], they were ‘giving away’ Colour TVs as lucky prize draws for people who managed to sit through their entire buy-one-ticket-and-get-one-free hyperbolic sales spiel. There’s only 48 tickets left and I’m giving you a chance to win 1 of 3 brand new Apple iPads if you book your tickets before Thursday 4 Nov 10am. That’s right everyone who’s invested in tickets by Thursday 4 Nov at 10am will go in the draw to win one of three brand new Apple iPads at this event…. Throughout the weekend we will be ramdomly [sic] drawing out tickets for these iPads. You must be the room [sic] to win so make sure you arrive early on Saturday morning because you just never know when the first iPad will go! Oh boy, Steve! A chance to go into the draw for a chance to win an iPad? Wow. 1. A FREEHOLD section in Memphis Tennessee that is yours to keep, sell or build on! Just think after spending two days learning some great new property investing strategies you could also walk away with a piece of freehold land in Elvis’ home town. Is that exciting or what? A search for the gullible? Impetus for a 'prize draw'? Does a ‘prize draw’ offer like this somehow attract the kind of people more likely to sign up for the get-rich-quick schemes these smooth-talking operators have a history of peddling like carnival barkers (whomever they’re partnered up with this week)? 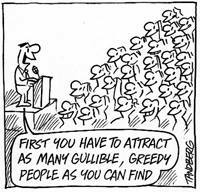 Are they looking for a group of gullible, greedy people, just as Ron Tandberg’s terrific cartoon suggests? 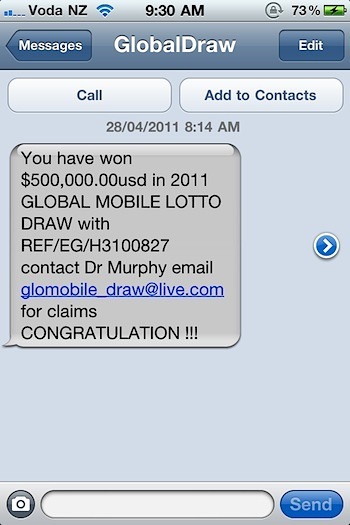 Does a ‘prize draw’ offer like this help attract a crowd of such people? It must do, I guess. Which raises another question: How much money do the salesmen expect to milk make out of that assembly of punters as a payoff … so that they can afford to ‘give away’ $400,000 worth of anything … assuming the prize is actually won? Facts are stated to the best of my knowledge and commentary is my honest opinion. Corrections or clarifications are always welcome by email. Comments are open. 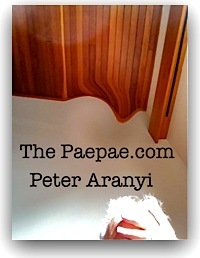 – Best wishes, Peter Aranyi © 2011 All rights reserved. This reminds me of the Next Wave Event held by Shaun Stenning and Vince Tan…the prize winners never get anything till today…typical of Shaun Stenning..
It’s hard to know if the Wood/Goodey approach to hoovering the pockets of the gullible/greedy is such a bad thing. Most people have good access to information and maybe it is just natural selection at work. Even the mildly uninitiated can realise that if their path to instant riches was so successful, they would not be wasting their energies trying to pass such ‘valuable’ secrets on. As for Wood boasting about being a $15M man (he doesn’t say if it’s nett assets! ), that to me is an indictment of incompetence rather than a reference. @John: I heard Lotto described once as ‘a voluntary tax on stupidity’ … a bit harsh, but I could see the point. On 5 seconds intense reflection, I also wonder if ‘Gullible and greedy’ is a little harsh in all cases. Desperation comes into play for some. Much of the target market is the 45 to 60 year age group. People reach this age and realise they are running out of time. They aren’t going to become the rock stars, movie actors, or millionaires of their youthful dreams. They still have 10 year old cars and a mortgage. What to do… and so they are a breathless market for the dream-sellers of instant wealth. Wait! That still comes under gullible/greedy. It always grated with me that the Blue Chip con was inflicted on people who got off their chuff and wanted to do something for their retirement … Gullible? yeah, maybe. Although it was a VERY smooth con run by VERY smooth operators. Greedy? Not so sure… My alarm bells went off when I heard (second hand) that the scheme involved them ‘buying the apartment back from you in four years’ … who would offer such a thing? The point of the Wood/Goodey-style ‘lucky draw’ if you stay the whole day/weekend seems nebulous to me. Designed to give them plenty of spruiking time. What do you make of it? A freehold Memphis lot? Wha? It smacks of time-share hucksters — but at least they gave every attendee a CD player or toaster oven for sitting through the BS spiel. I went along to the richmastery seminar 2 or 3 years ago and boy they are very good salesmen! I could see a few people from the audience parting with thousands of dollars using their credit card to pay for a mentoring programme. Now I hear of people selling off properties they bought through with the help of richmastery because they are so heavily geared – now those are the gullible people that got sucked in hook, line and sinker. Thanks for sharing your personal experience and conclusions Yep, these types are often very smooth salesmen. The current crop are very polished … and, it seems to me, like others, have honed their patter and approach to identify and activate their punters’ hot buttons. Sean Woods and Co are very good con artists. My partner signed up on the mentoring program with the promise of being taught how to become a successful property investor. Instead it turned into a group of people combing the south auckland market for ‘deals’ and then driving around the area as a group to each property listed where the almighty Sean Woods would give his high handed opinion on what to offer, wot to spend on a renovation and how much to rent it for. The only work Sean had to do was turn up every Tuesday. He didnt have to research the market because the students did that for him and brought him the info on a weekly basis. Many students followed his advice and purchased properties and are now finding themselves barely servicing the huge debt acquired. Often students from previous years prey on the naiveity of the first year students and lump the sour deals on to them with Sean’s blessing. He is using property tutors as a way of controlling the south acuckland market to keep prices high, because thats where the majority of his properties are. He said himself that property tutors equates to 50% of the investors in South Auckland. He doesnt teach people how to research property markets or give people the tools to become a successful investor all he does is advise people on what to buy and leaves them dependent on his knowledge. He no longer purchases property in south auckland because he knows it is very rare to find positive yielding properties there anymore. I wish we had been a bit more prudent before we had parted with the 28000 but i am grateful we wised up before we ended up in 100s of thousands of debt or before my partner became a 15 million dollar in debt man like sean was. Most of the students dropped out with a loss of 28k some worse off, others came back because of the stress of having million dollar mortgages. The only people that did ok were the ones Sean took a shining too, especially the young more attractive women. Wow, that’s pretty harsh. Thanks for sharing your views and experience. I take it you and your partner are no longer involved?